Butter. Sugar. Flour. Classic. Most people really like spritz cookies. They are basic, but you can spruce them up by adding sprinkles or flavorings or even dipping them in chocolate. I like them because they are (almost) as pretty as (much more tedious) cut-out cookies, but they taste just as good and are much easier to make. My husband (then-boyfriend) bought me a cookie gun (I know it's called a cookie press, but I renamed mine) about ten years ago as a Christmas gift. I still have it, but it's battery operated and I haven't removed the batteries in years, so I snagged an new (still in the box) Pampered Chef cookie gun at a neighborhood yard sale last year (no batteries required). The dough will only work if it's freshly made (soft). Don't try to refrigerate the dough and make the cookies later. It will be way too thick for shooting. I let my freshly baked cookies cool completely before eating them. This is one cookie that tastes better and holds up better when it's cool. I also let them sit out for several hours (or overnight) before packing them up to travel. Use an ungreased baking sheet. Don't line it with Silpat or parchment paper. The cookies are full of butter and they will not stick. Pan liners just make it more difficult to release the cookie dough for the gun. These cookies do not expand much during baking, so you can press them pretty close on the baking sheet. Fit Cookie Press with desired disk; fill with dough. Press dough onto Cookie Sheet 1 in. (2.5 cm) apart. 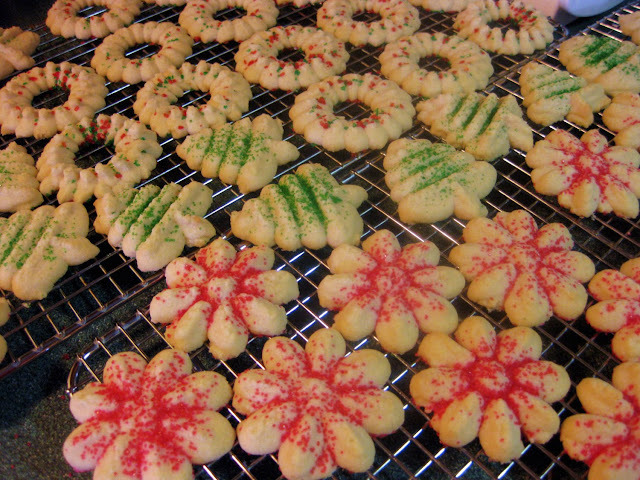 Decorate cookies with colored sugar or sprinkles, if desired. Bake 10-12 minutes or until edges are light golden brown. Cool cookies 2 minutes on Cookie Sheet; remove to cooling rack. Repeat with remaining dough.